Spain has a culture that is rich and culturally diverse. 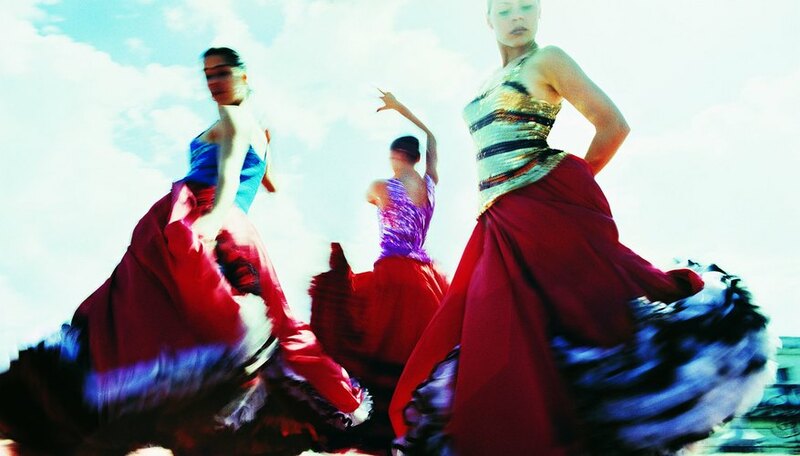 That diversity is reflected in the different styles of Spanish dance being performed in cantinas, clubs, village squares and on stages across Spain and by extension, around the world. Many ancient regional folk and traditional dances were lost during the years dictator Francisco Franco was in power. From 1939 to 1975, Franco banned or restricted them, along with all other regional forms of culture. Those dances that survived include archaic forms such as the jota and the paso doble, in addition to the globally popular flamenco. Flamenco is associated most specifically the region of Andalusia. It arrived with migrating gypsies in the 12th century; they brought with them influences from the Middle East and even India that affected the evolution of the dance. Today, this passionate form, performed by both men and women to guitar and vocal accompaniment, is popular and practiced from Spain and Mexico to Japan. Ground zero for traditional or “flamenco puro” is the old city of Seville in the south of Spain. According to Arthur Murray, the bolero is a slow-paced dance for a soloist or couple that was created by a Spanish dancer named Sebastiano Carezo in 1780. The Spanish version differs from a significant Cuban version that developed independently in the last part of the 19th century and has influenced the Americas, where it sometimes is known as the rumba. The Spanish version is in three-quarter time (like a waltz) and generally is accompanied by castanets, guitar and singing. The paso doble ("double step") originated in France but the bullfighting culture in Spain quickly adopted it. Its dramatic steps and stately rhythms are reminiscent of a matador's movement in the ring. Famous bullfighters have been honored with paso doble tunes named after them. In contemporary times, it usually is not a social dance -- although it sometimes is done at weddings -- but is performed or danced competitively. Aragon in northern Spain is the birthplace of the jota, a quick-paced folk dance that has been called a courtship ritual. Various versions of the dance also sprang up in other regions over the course of the 19th century, each with distinct variations. Generally, it is danced by a couple, who hold their arms high in the air while jumping and placing their feet; they often play castanets as well.